In the early 90s,Barseg toured Australia with great success where he was given a special award for his role as Mephistopheles in ‘Faust’ by Charles Gounod. Tumanyan made a highly successful debut at the Nederland’s Opera with Luisa Miller, and then returned to the Royal Opera House in June 1997 for the Verdi Festival to give a spectacular concert performance. In 2002/2003 he had recitals in Washington Boston Providence ,Montreal ,Toronto,and in 2004,he had recitals in Austria Germany and The USA. Since 2005,Barseg has performed in Vienna ,Salzburg Munich Berlin and has been warmly received throughout Europe. 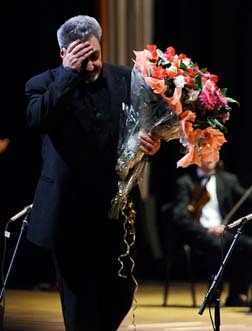 Barseg participated in concert held as part of an Armenian cultural Festival in St.Petersburg where he appeared with the famous local Philharmonic Orchestra. He also performed in China and Japan. Recent concert appearances include recitals and opera performances at The Annual Festival St.Petersburg Palaces under Rojdestvensky, and outstanding concerts in Russia , Austria and Germany. Tumanyan was awarded ‘Peoples Artist’ of Republic Of Armenia. He is the Vice President of The International Academy of Science of Natural and Society(2002).Current Member (Academician) of the European Academy of Natural Sciences member of International Academy of Spiritual Unity of the peoples of the world(2003). In 2003 was designated as a Knight and became a member of International Knights’ Unity in Germany. In 1990 established a unity ‘‘Tumanyan’’ company Ltd. Made researches in the field of the sources of classical carpets. As a result of the investigations in cooperation with outstanding professionals of Armenian carpets, artist-designers, ethnographers, created unique collections of original ornaments of Armenian carpets which has no analogs nowadays. He established international cultural foundation ‘’Renaissance’ for the propaganda of Armenian and international culture. Is the President of Armenian branch of International Delphic games.